On Friday it was near 60 so I took the opportunity to add a cake of fondant (“bee candy”) to the hive. The nice thing about a top bar hive is you can open up only the portion of the hive you want to get at without disturbing the winter cluster. I put the fondant by the follower board at the back by placing it in a manilla envelope (thanks, Miles!) and making some slits in it so they can get to the candy. I could only see the back part of the hive, and I only encountered a couple of curious bees, but I couldn’t see any honey to speak of on the last two combs. I’m hoping that there is more honey near the front, but at least now they have some alternative food with the fondant. On Friday night, my son Patrick went outside and said, “There’s no way it’s going to snow. It’s too warm!” Saturday, we woke to about 3″ of snow and by today, we have about 6″ from the storm and the morning low was 6F. Tonight is supposed to be even colder with lows below zero. 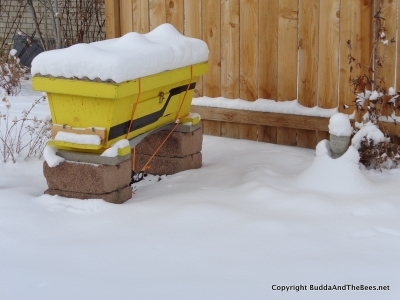 Typical winter weather in Colorado, but pretty tough for the bees. Not as cold as my friends and family back east have been experiencing, but still cold! I hope the girls are all clustered tightly in the hive and keeping warm. They keep the center of the cluster (where the queen is) at 92 degrees F, generating heat by “shivering” their wing muscles. Unfortunately, some of the bees on the outside of the cluster end up freezing and I expect that the next time it warms up, the caretaker bees will be dragging out their departed sisters and there will be a pile of dead bees in front of the hive. After the last cold snap in December, there were at least a hundred on the ground in front. I hope there are still a few thousand left inside. I spent part of yesterday at a gathering of beekeepers to learn about creating Bee Safe Neighborhoods, a project created by the Living Systems Institute and Honeybee Keep. The basic idea is to get your neighbors to stop (or at least reduce) using pesticides which are not only harmful to bees, but also to humans. (I’ll write more about this in a future post). It was great getting to meet some new beekeepers and swap stories. Several of them had lost their colonies this year, so I feel fortunate that as of Friday, my bees were still alive. Even if my bees survive the winter, there’s a toxic world out there waiting for them. One beekeeper told me it can take about 18 months for the effects of the pesticides show up. For now, I just want them to make it through the winter.